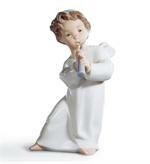 Lladro - It started with an angel! 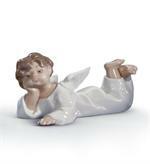 Nielsens Gifts Home Shopping Cart Page > Lladro Porcelain > Lladro - It started with an angel... actually five darling Lladro angels! 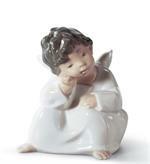 "Nielsens is known for their huge selection of Lladro fine porcelain. 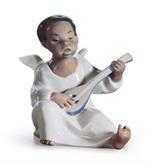 It all started with an angel in the early 1960s! My mother, Dorothy Nielsen, choose a darling group of angels 50 years ago! She was at market in Dallas when a representative asked my mom "Mrs. Nielsen, do you think your customers in Nielsens would enjoy these porcelain angels made by the Lladro brothers?" She said, "yes!, because they have personality!" She was right- they loved them and...You will today,too!" 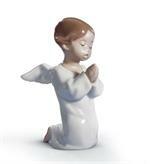 One of the five original Lladro angels.